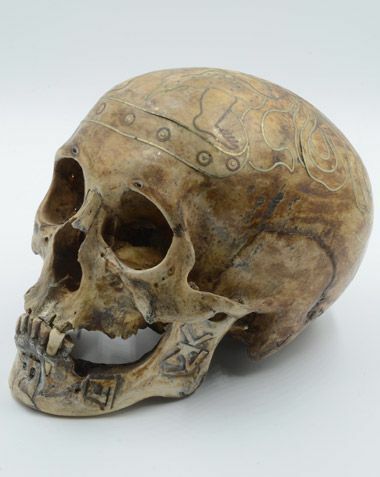 A human skull from Tibet, decorated for ritual use. The top of the skull has inlays of copper and brass producing a human figure together with intricate plant-like design. The lower jaw has letters from the Tibetan alphabet carved in relief into it. Very fine and precise work! The skull cult plays an important role in Tibet. Often figures of gods are produced with skull-bowls in their hands. The more honourable the life of the deceased was, the more useful his skull is in rituals.